PACK EXPO Las Vegas had a record-breaking show this year! The event welcomed nearly 29,000 attendees visiting 2,006 exhibiting companies. Read more about PACK EXPO 2015. If you didn’t have a chance to visit our booth in person, check out the video at the end to see our conveyors in action. 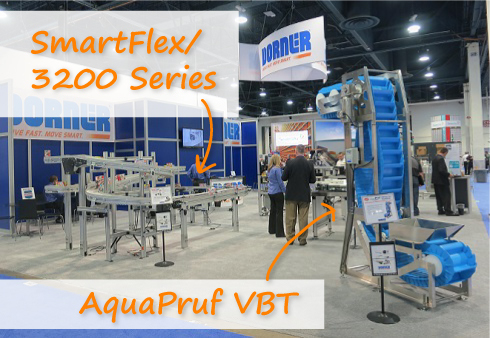 We had many new displays in our booth this year including the new AquaPruf Vertical Belt Technology, our sanitary belt conveyor for elevating bulk products. We also brought our updated 3200 Series Modular Belt Conveyor / 2200 Series SmartFlex Display which includes the new SmartFlex Helical Curve. The new SmartGrip conveyor premiered at PACK EXPO. This conveyor utilizes Grabit’s Electroadhesion Technology to provide adhesion on demand. The technology creates a holding force without damaging the product. Stay tuned in the coming year for more information on this brand new technology. Our 1100 Series Miniature belt conveyor was updated for the show this year. The new conveyor loop included additional features such as a backlit conveyor, both end and center drives and more varying widths. The 1100 Series is ideal for small or lightweight product movement and medical, pharmaceutical and life sciences applications. Our Flexible Package Handling display demonstrates many of the different ways that we can handle flexible packages. This display demonstrates our SmartPace Dynamic Pacing Conveyor that takes randomly spaced products and paces them into even spacing without the use of diverts or plows. The AquaGard 7100 Series Conveyor in this loop is the most flexible option in our sanitary line of conveyors. Click the links to any of the product pages or Contact Dorner to learn more about our products.